The Inner Loop in Rochester, New York on Tuesday, October 4, 2016. Recently filled in, the eastern segment of the Inner Loop was a sunken expressway that separated downtown from the city's east end. Residents speak with a building attendant at Tower280 in Rochester, New York on Friday, October 7, 2016. A renovation to transform the building into a mixed-use space including apartments, commercial, and retail is nearly complete. Lovely Warren, the mayor of Rochester, New York, pictured at City Hall on Thursday, October 6, 2016. Workers pour a new driveway at The Metropolitan in Rochester, New York on Wednesday, October 5, 2016. The 26-story former Chase Tower is undergoing a $30-million renovation to modernize office space, and to add condominiums and apartments. Monroe Community College students wait for an elevator at Sibley Square in Rochester, New York on Wednesday, October 5, 2016. The former home of Sibley's department store, the 1-million square foot building is undergoing a major renovation to add apartments, retail, and commercial space. The Metropolitan, a 26-story office tower that is undergoing renovations to add apartments and condominiums, in Rochester, New York on Friday, October 7, 2016. Lauren Gallina is marketing manager for Gallina Development in Rochester, N.Y. on October 5, 2016. Gallina Development is overseeing the transformation of the 26-story Metropolitan Tower. 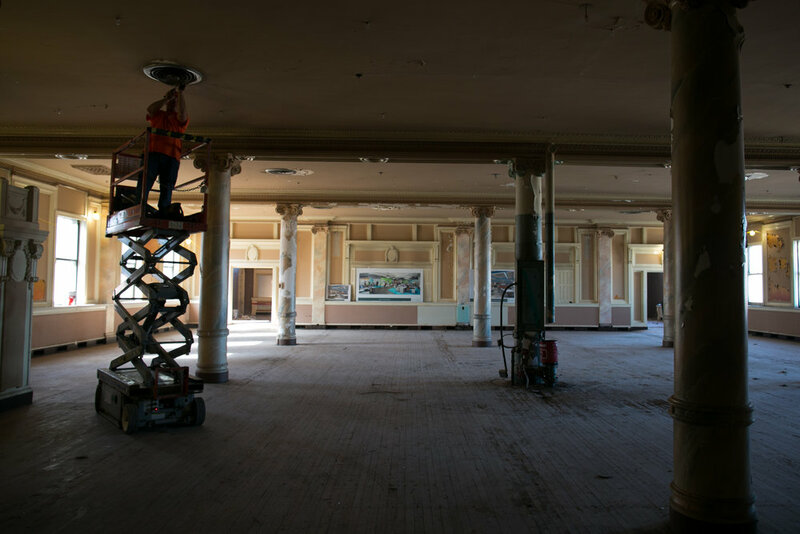 Crews work to renovate the former Tea Room restaurant at Sibley Square in Rochester, New York on Wednesday, October 5, 2016. The 1-million square foot building was home to Sibley's department store from 1906 to 1990. An apartment at Tower280 in Rochester, New York overlooks Sibley Square, center, a long-empty building that is currently being completely renovated to add residential, retail, and commercial space. Nelson Leenhouts, President and CEO of Home Leasing LLC, is photographed at the company's Charlotte Square site in Rochester, New York. The first phase of the project includes 74 apartments, expected to be ready in November 2016.